User authentication is very common in modern web application. It is a security mechanism that is used to restrict unauthorized access to member-only areas and tools on a site. In this tutorial we'll create a simple registration and login system using the PHP and MySQL. This tutorial is comprised of two parts: in the first part we'll create a user registration form, and in the second part we'll create a login form, as well as a welcome page and a logout script. 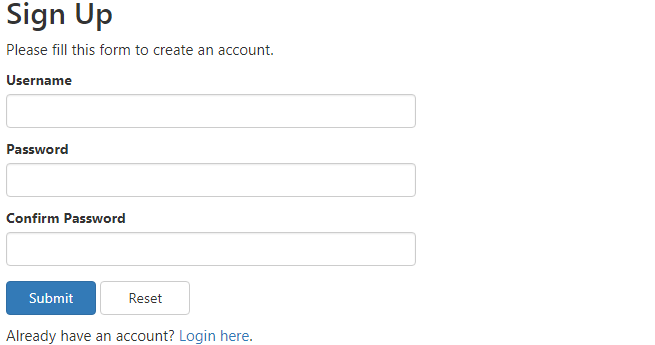 In this section we'll build a registration system that allows users to create a new account by filling out a web form. But, first we need to create a table that will hold all the user data. Execute the following SQL query to create the users table inside your MySQL database. Let's create another PHP file "register.php" and put the following example code in it. This example code will create a web form that allows user to register themselves. This script will also generate errors if a user tries to submit the form without entering any value, or if username entered by the user is already taken by another user. In the above example, we've used the PHP password_hash() function to create password hash from the password string entered by the user (line no-75). This function creates a password hash using a strong one-way hashing algorithm. It also generates and applies a random salt automatically when hashing the password; this means that even if two users have the same passwords, their password hashes will be different. At the time of login we'll verify the given password with the password hash stored in the database using the PHP password_verify() function, as demonstrated in the next example. We've used the Bootstrap framework to make the form layouts quickly and beautifully. Please, checkout the Bootstrap tutorial section to learn more about this framework. Tip: Password salting is a technique which is widely used to secure passwords by randomizing password hashes, so that if two users have the same password, they will not have the same password hashes. This is done by appending or prepending a random string, called a salt, to the password before hashing. In this section we'll create a login form where user can enter their username and password. When user submit the form these inputs will be verified against the credentials stored in the database, if the username and password match, the user is authorized and granted access to the site, otherwise the login attempt will be rejected. Let's create a file named "login.php" and place the following code inside it. Here's the code of our "welcome.php" file, where user is redirected after successful login. If data comes from external sources like form filled in by anonymous users, there is a risk that it may contain malicious script indented to launch cross-site scripting (XSS) attacks. Therefore, you must escape this data using the PHP htmlspecialchars() function before displaying it in the browser, so that any HTML tag it contains becomes harmless. For example, after escaping special characters the string <script>alert("XSS")</script> becomes &lt;script&gt;alert("XSS")&lt;/script&gt; which is not executed by the browser. Now, let's create a "logout.php" file. When the user clicks on the log out or sign out link, the script inside this file destroys the session and redirect the user back to the login page. Finally, in this section we will add the password reset utility to our login system. Using this feature logged in users can instantly reset their own password for their accounts.